Tag the people (and pets) in your photos. We suggest people so you can just click once. Want to find out more? 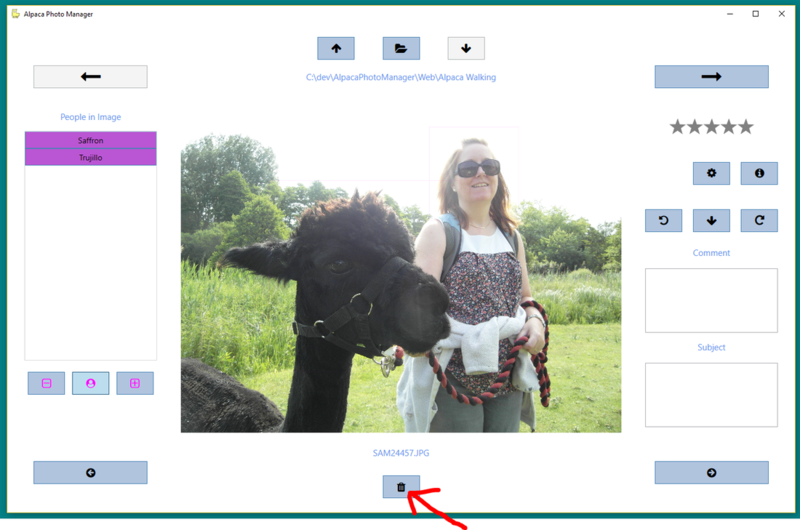 Click the button below to sign-up to receive news about Alpaca Photo Manager, including when it becomes available and where you can get it from. Buttons are disabled where there is no next or previous image or folder (shown light grey). In the screenshot above the Next Image and Child Folder buttons are disabled for this reason. Click on the person's name in one of the three lists or type their name and press enter. To start with the lists may be empty. This may be because you've not yet tagged anyone. If you've just started the application it may not yet have had time to read through other photos to collect all suggestions. Try closing the dialog by clicking the cross and trying again after a short while. 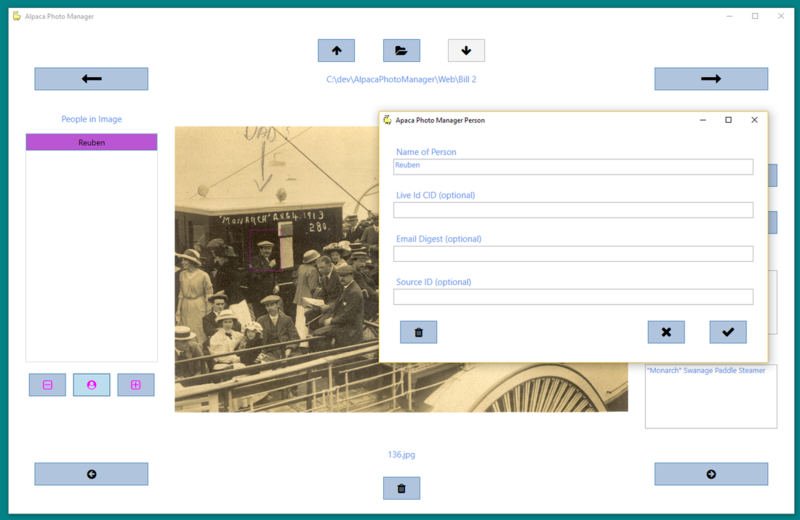 The application steps through folders of images to find suggestions. These folders can be controlled in the application's settings. Once it finishes going through all these folders the Alphabetical and Frequency suggestions won't change unless you restart the application. Only people tagged in the current run of the application appear in the Recent list, so each time you start the application it will start empty. A magenta colored rectangle will surround a tagged person in the photo. Hover over it to see their name. 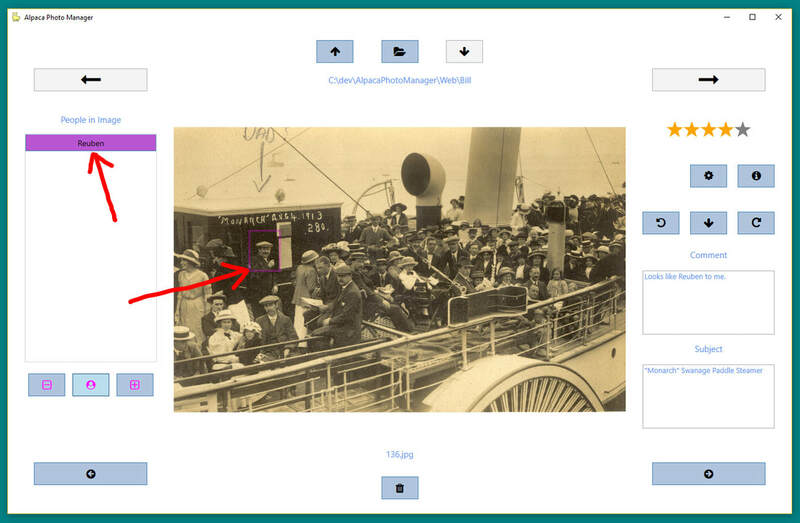 Hover over their name the "People in Image" panel to identify them in the image (their rectangle is shown green). 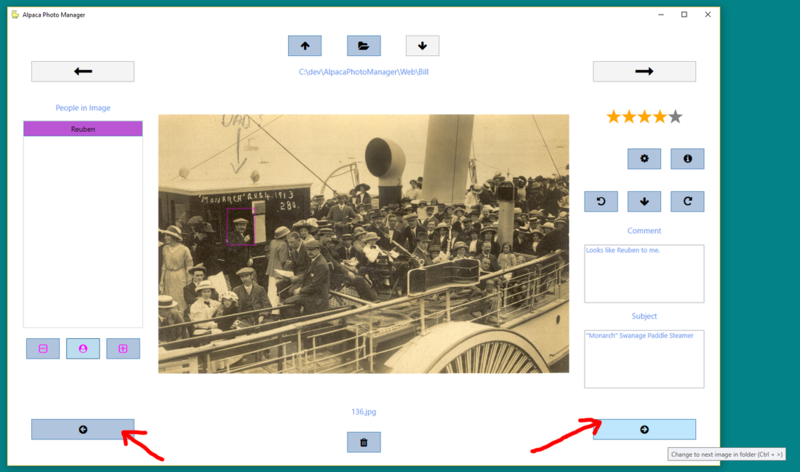 People listed in the "People in Image" panel may not have rectangles if they have been created by other applications that allow this. 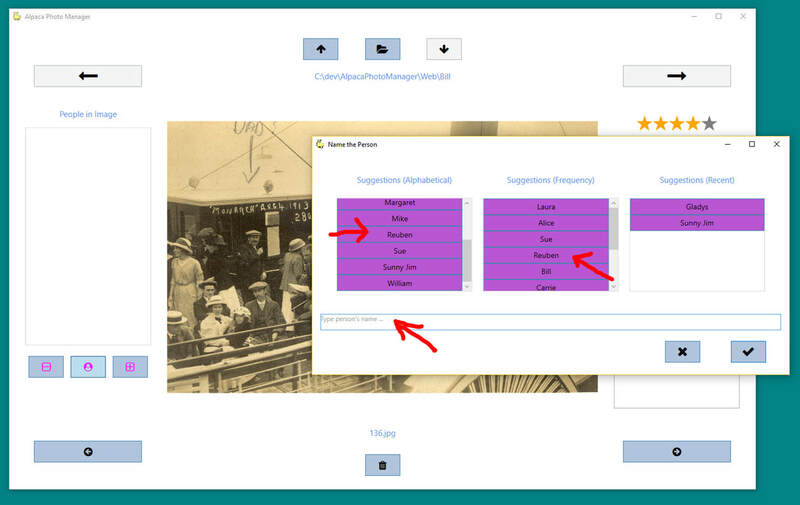 We recommend creating a new tag for them with a rectangle, then deleting the old one. Deletion of people is described below. If you use the same name multiple times in a photo, multiples will be shown suffixed with "", "", etc to distinguish them. The names will remain unsuffixed within the photo's actual data. The width of the rectangles surrouding people (or alpacas) may be too thick or too thin. Buttons 1 and 3 decrease and increase their width. 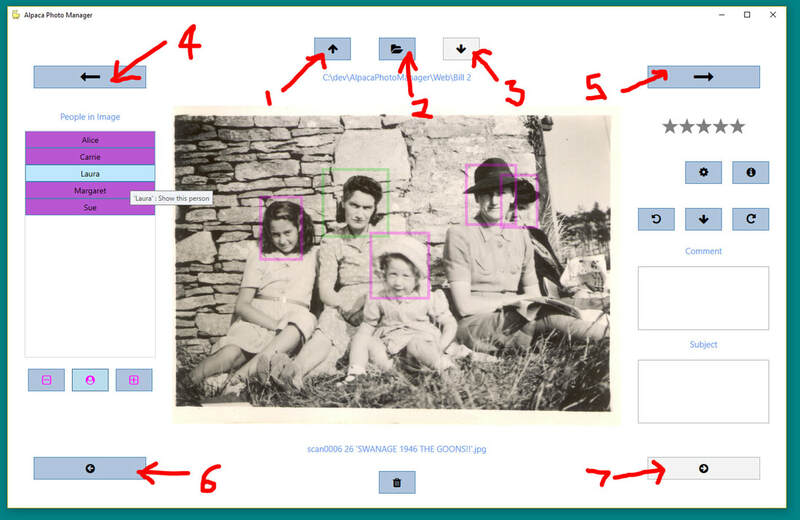 To edit their name or delete them click their magenta coloured rectangle or their magenta coloured button in the "People in Image" panel. Change the name or other details and then click the check (tick) button in the bototm right to close the dialog. To delete them click the trash can button in the dialog. The dialog will close and the person will be deleted. The trash can button on the main screen deletes the whole photo - please don't get confused. As well as the person's name you can change their Live Id CID, Email Digest or Source ID. These may have been created by legacy software such as Microsoft's Windows Live Photo Gallery. We recommend you leave these as they are or deleted them completely, but the choice is yours. Microsoft's People Tagging Overview says the Live Id CID "Stores the signed decimal representation of the person's Live CID, a 64-bit integer that publicly identifies a Live identity". It's not something you'd normally edit. We included it as it is important to be aware that photos can store personal information like this. You may wish to delete it before sharing photos publicly. Microsoft's People Tagging Overview says the Email Digest is "the SHA-1 encrypted message hash of the person's Live e-mail address". As such it won't be very human readable. We've included it to let you know it's there and to allow you to delete it if you wish. It's not something you would normally edit. The Source Id was used by Microsoft's Windows Live Photo Gallery to store things like a person's Skype name or Skype phone number. We included it as it is important to be aware that photos can store personal information like this. You may wish to delete it before sharing photos publicly. Navigate to another image or folder to save the changes you have made. Alternatively close the app and it will save the changes. 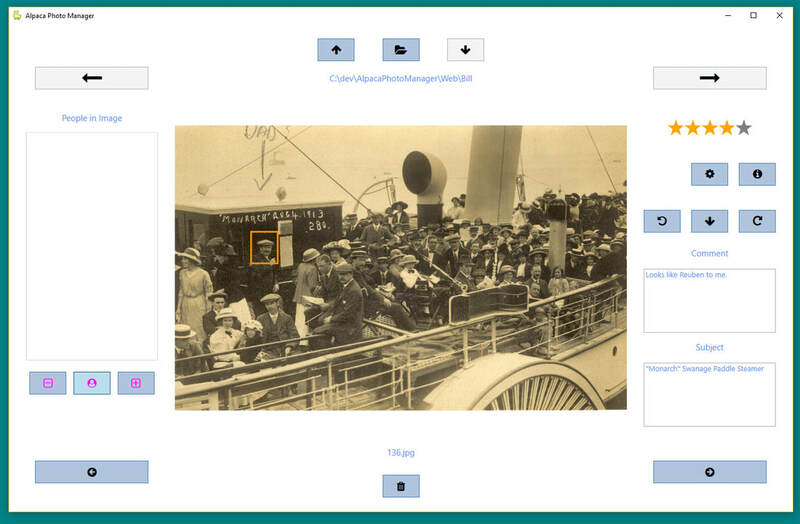 To delete an image click the trash can button at the bottom centre of the main window. This will delete the image immedietly without confirmation. Our aim is to provide quick and easy photo processing so we have chosen to keep things one click where possible. As with most software that change photos it is possible you could accidentally delete photos or make changes you wish to undo. Alpaca Photo Manager doesn't yet have an undo facility so it is wise to keep a backup of your photos. 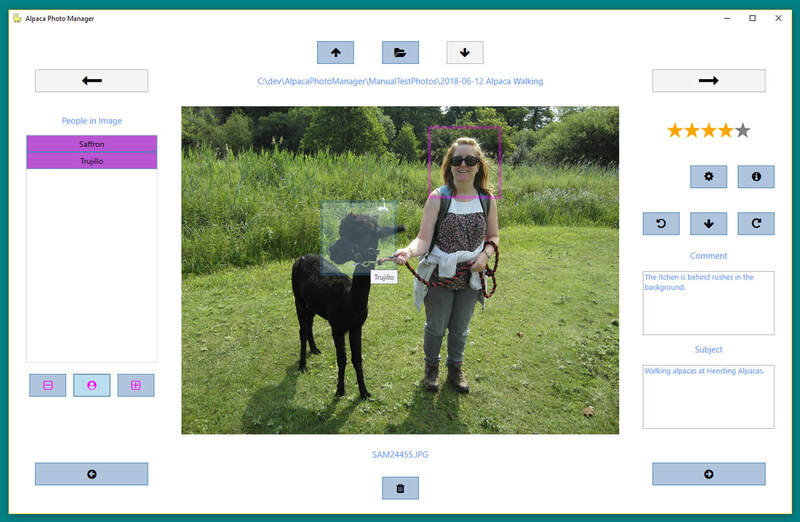 Like all software Alpaca Photo Manager may have bugs. It is thoroughly tested with a wide variety of photos from different cameras, but it is not feasible to test it with all possible types of photos and circumstances of use. Again please keep a backup of your photos to guard against the unlikely possibility that something goes wrong.